In 1956, Gertrude Fyler Hotchkiss bequeathed her impressive family home, including its contents, to the Torrington Historical Society. The collections of the Hotchkiss-Fyler House Museum include fine and decorative art collections which were amassed by the family over more than 50 years. Gertrude F. Hotchkiss, the last family member, who occupied the home from 1936-1956. 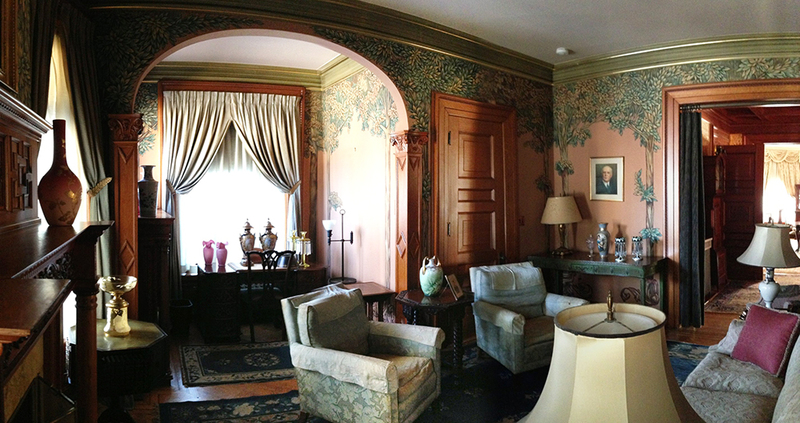 Gertrude was an avid collector and the house, as it is today, showcases her interests. Gertrude’s tastes were very eclectic and they also reflect the time period in which she was raised. As a privileged woman who grew up during the Victorian period, she learned to admire and appreciate glass and porcelain pieces that were exported to the United States from other countries as well as similar pieces that were made in this country. Gertrude Hotchkiss purchased such wares at antique shops, auction houses and estate sales and filled her home with these pieces. She also had a keen interest in French furnishings and collected several 18th century French pieces of furniture to decorate her home. In addition, the collection also includes several Chinese and Persian carpets.